Often it is difficult to find a specific object on a large design. To find the needle in the haystack use the Find Design Object dialog. When executing the find functionality it will select, zoom and report all objects found matching the specified criteria. 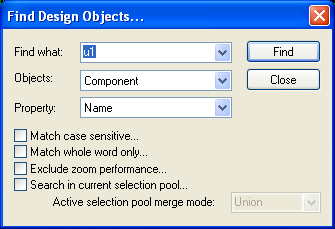 The Find Design Object functionality is aimed to search in all standard object properties. If the criteria match to many objects it is possible to continue the search in the current selection pool. Once the objects has been reported they can be managed from the output toolbar.